Growing up, I didn’t eat a lot of Mexican food. In our house it was all Chinese food all the time thanks to the unadventurous palate of my father. My dad’s the kind of man who’ll insist on eating Chinese food whether he’s at home or on vacation where the only option for Chinese food consists of orange chicken and chop suey. Unlike my dad, I’m willing to give anything a go just once. And if I’m on vacation you better believe I’m eating where the locals eat. A couple of years back Mike and I stayed in Playa del Carmen for a little over a month and I sure as hell stayed away from the Señor Frogs. Instead we were found stuffing our faces with street tacos with the rest of the locals. I became a little addicted to street tacos after that trip. And even though Vancouver may seem like a city filled with tonnes of options for ethnic food, it wasn’t always so. It used to be that authentic Mexican food just couldn’t be found. Thankfully there are a bunch of little taco joints around now. My favourite of the bunch is La Taqueria: an authentic Mexican run shop that specializes in street tacos. Street tacos means street taco sized tortillas. (Street tacos tortillas are tiny, maybe only 4″ in size.) The last time I was at La Taqueria, I asked if they made their tortillas in house. I figured I could buy some off them and play with street taco making at home. The Friendly Taco Guy answered no, but he helpfully told me where I could buy them. Me: So…where do you get your tortillas then? Friendly Taco Guy: This tortilla factory…I think it’s called El Comal. Friendly Taco Guy: El Comal. At this point, I was distracted by our tacos, so Friendly Taco Guy started talking to Mike instead. Turns out El Comal is little Mexican Food Factory located in Burnaby. A bit of a drive for us, but their daily made corn tortillas are worth it. Even if you can’t find tiny tortillas, you should give this recipe a try: it’s flavour-packed and fresh. 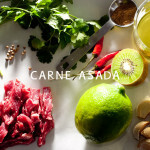 I am hand-held, I am steak-filled: I AM CARNE ASADA TACO! Looks amazing, like the style of your blog. Holy moly! 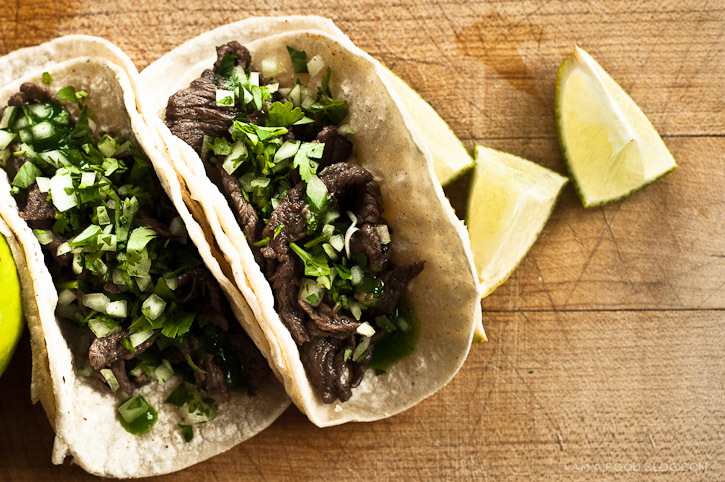 As a Mexican and a lover of tacos…these look amaze! And I’ve tasted my fair share of street tacos! I’m intrigued by the marinade…kiwi? I must try it! Maybe it’s all Chinese fathers! Mine is the same exact way about food. And if we drag him to a non-Chinese restaurant he gets pasta without fail because its the closest thing to mian tiao! I just wanted to say that I’m in love with your blog.. and not too many blogs make me say this. You get food and I love the way you present it. As someone who is aspiring to have my own successful food blog I definitely gain inspiration from your food and your presentation. 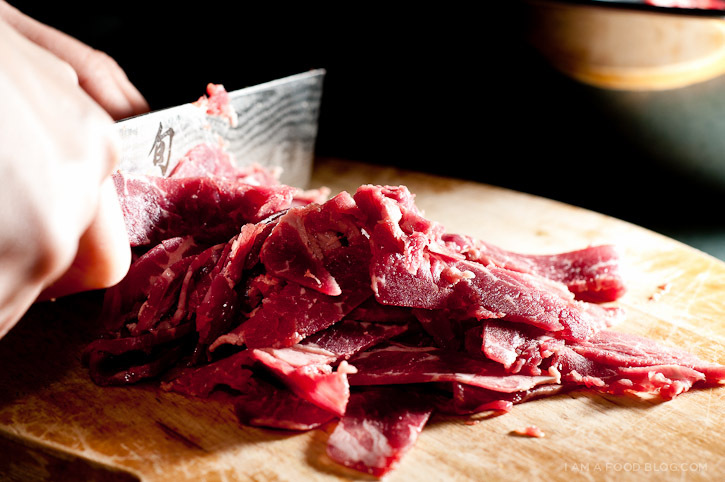 at our next barbeque here they can have their burgers, I’ll roll out the real food. I’d have to agree w/everyone else. Your blog is wonderful! 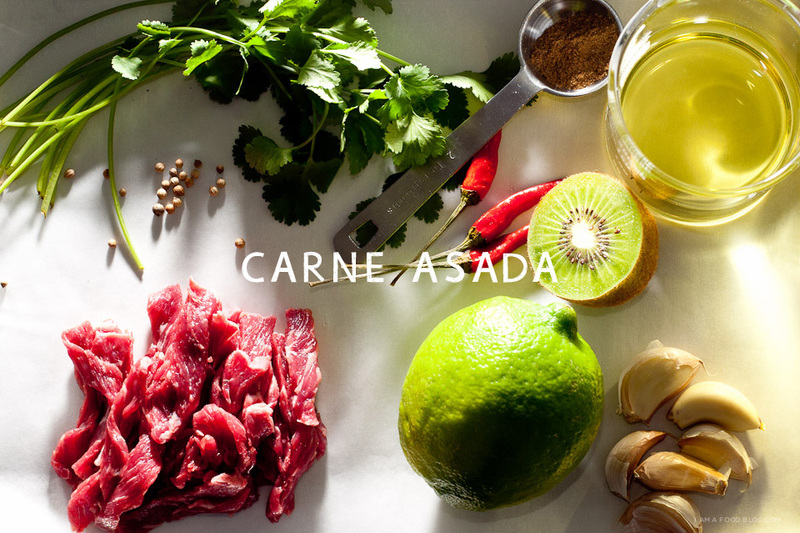 Would like to know if I could use eye of round to make carne asada. Never tried it before but preferred the look/texture of it compared to what the store had to offer called carne asada. first of all, your blog is so beautiful! so well designed, great photos– i’m jealous! secondly, thank you for this recipe. it’s been a favorite on my blog (thedinnerclubrva.blogspot.com) and a big hit in my house as well. keep up the great work! Am super excited I found your blog. 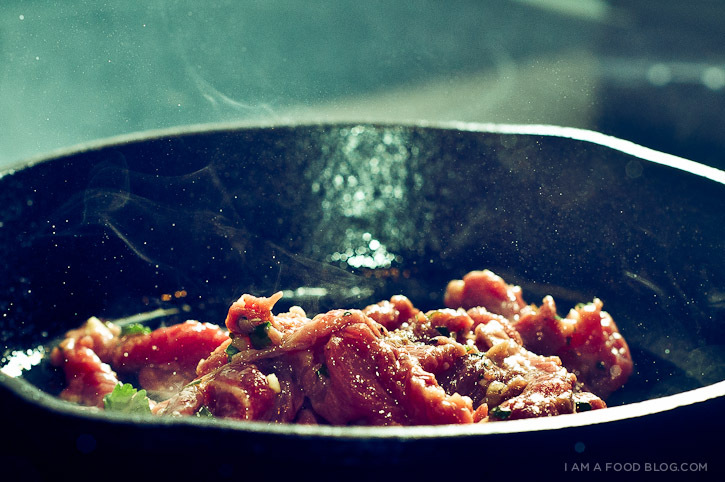 I am getting ready to cook my flat iron strips for Carne Asada, in about 10 minutes. Yum! hi patty! i used white sugar but brown would work as well. I made these last night for Superbowl Sunday and they were delicious. I used a fresno chili and jalapeno pepper for the heat. I marinated the meat for about 3 hours and definitely would not have wanted to go much longer. I did not know Kiwi would break down meat until I read your recipe. I was going to put these on the bbq but just as I was about to fire up the grill, the rain started so I did cook them on my grill pan indoors. 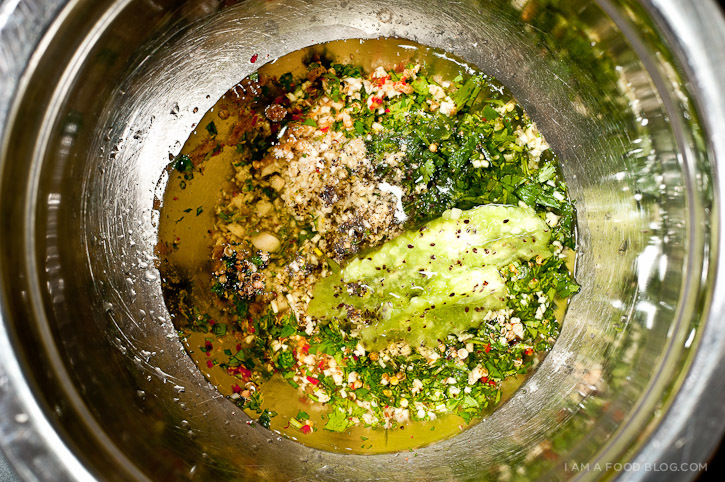 The aroma was awesome with the combination of the coriander seeds and other spices. I made cauliflower mexican “rice” on the side cooked with some chopped tomatoes, cumin, paprika and cayenne, a little more jalapeno, onion, peppers, corn and cilantro. It was as tasty as it was pretty. This was a great meal for a large group and so easy. Looking forward to more posts from you. My next project will be the miso glazed eggplant. I love your blog. I love it mainly for its no-nonsense name! I have almost always used skirt steak for carne asada before but I need to make use of about 5lbs of flat iron steaks and this will fit the bill nicely!